It’s hard to believe that 2011 is nearly over. I get so wrapped up in my day to day life, raising kids and cattle, that I forget time is steadily marching on and before I know it a new year is fast approaching. Last night, my son asked me what my New Year’s Resolution is for 2012. I told him I had no idea and I would have to get back to him later. After I tucked the kids into bed I had some time to reflect on 2011 and ponder what 2012 will bring to my family. For me, this year has been about finding balance. Balance with my family and the ranch. Balance with my work in cattle industry organizations and the daily cooking and cleaning in my home. Balance with church and kids’ school activities. I will never achieve a perfect balance in my life and that is okay. I have learned that I can’t balance the minutes or hours each day, but on average, over the course of time, there is balance. 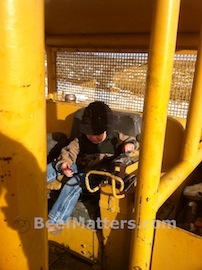 Looking back over 2011, there were times when I was out of town for meetings and missing my family and the ranch. There were also days when I felt trapped at home immersed in endless laundry, cooking and cleaning. Times when I was riding with my husband and mentally calculating how much time I would need to read the materials for my meeting that evening. This line reminds me to enjoy the fleeting moments of my life. If I leave my house in disarray or miss a meeting in order to spend the day trailing cows with my family (a wild and precious event) that is not only okay, but it’s a great choice for that day. Consequently, I shouldn’t spend the day fretting about balance. I need to remember that it’s about the small choices I make every day adding up to balance over a longer period of time. Not exactly a resolution, but I am hopeful for a gradual shift in my choices throughout 2012. Continue to focus on balance, but not at the expense of enjoying my “one wild and precious life”. I hope you all had a wonderful Christmas. Did Santa arrive at your house? Although there were many discussions about the possibility of waking up to coal on Christmas morning, Santa is apparently a kind-hearted (and forgiving) soul. Toys were delivered and gifts unwrapped. We ate cinnamon rolls and drank hot cider (kids) or coffee (me). Lounged around in comfy clothes for a couple of hours. Then we went back to work: Break ice for the cows and deliver a little protein block to the heifers. My husband’s family is all here for Christmas this year and we have spent the past few days together. Yesterday we went sledding. 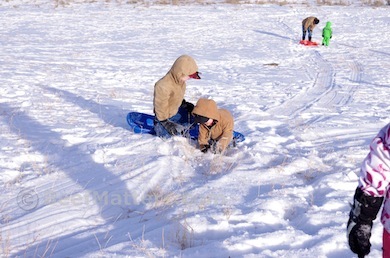 So, we bundled the kids, grabbed our sleds and set out in search of snow yesterday afternoon. After thirty minutes we found the perfect spot. 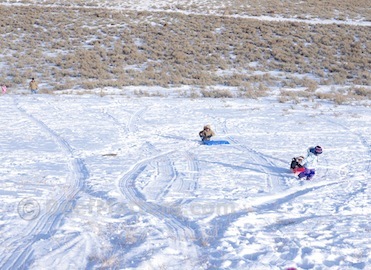 After another thirty minutes of unloading and hauling our gear to the top of the sled hill, the kids climbed on their sleds and took off down the hill. 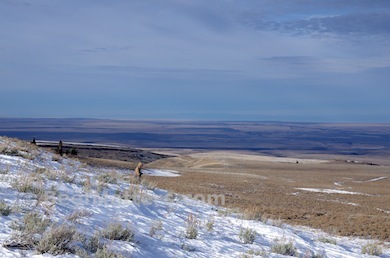 Only to land in the sagebrush barrier at the bottom. For some of the little ones it was nearly a twenty minute hike from the bottom of the hill back to the top. 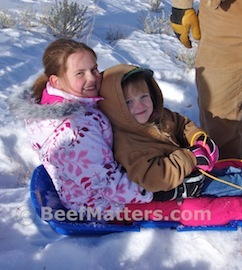 But, they were still grinning when they climbed onto their sled for the next ride. This is my favorite photo of the day. I love the orange baling twine on the handle. I love that my son has once again pulled off his mittens, despite my pleading to leave them on his cold little fingers. 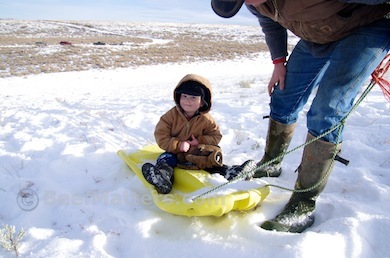 I love that my brother in law rode down the hill with my son and pulled him back up the hill on the sled. The older cousins were not impressed with the tame hill that the parents and younger kids were conquering. They set off on their own, determined to find a steeper hill. I informed my boys that we were a long way from the hospital and I had no plans to drive to town today, so please don’t injure yourselves. We are off to enjoy another day of fun in the snow. 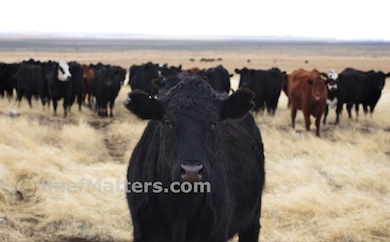 Earlier this month, my husband spent a few days in Montana at a large cow sale. 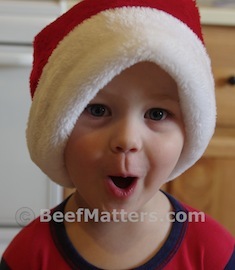 It is an annual sale and this year they sold 6500 head of bred cows in two days. 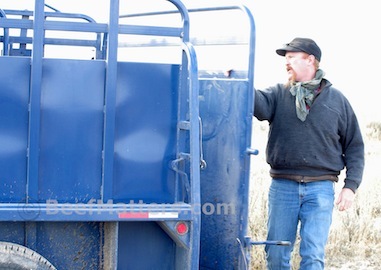 Traditionally, the cows that come through this sale are good cows and this year was no exception. My husband bought two pens of bred heifers that we are quite excited about. When my husband abandons me and the kids for several days, we often find ourselves roaming around missing Dad looking for something fun to do. It’s always interesting what we come across that the kids want to play on. Have I mentioned that we don’t have a lot of playground equipment in our back yard? 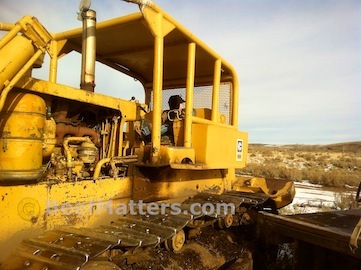 Who needs it when we have old creep feeders to climb on and bulldozers to pretend to drive? 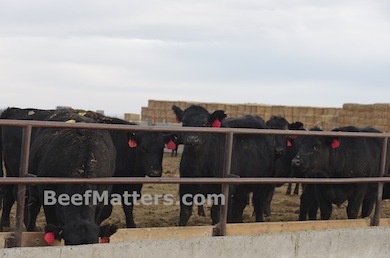 The heifers spent a few days in a pen at the feedlot while adjusting to life on our ranch. 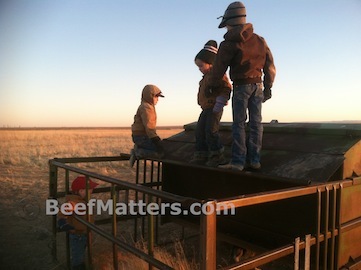 Although the kids and I missed him while he was gone, I admit he did buy some great heifers. They have been AI bred and I am excited to see their calves. There is only one small catch with his recent purchase: the heifers are set to calve January 20th!